This simple test is designed to measure your cardiovascular endurance. a 12 inch high bench (or a similar sized stair or sturdy box), watch for timing minutes. Step on and off the box for three minutes. Step up with one foot and then the other. Step down with one foot followed by the other foot. Try to maintain a steady four beat cycle. It's easy to maintain if you say "up, up, down, down". Go at a steady and consistent pace. This is a basic step test procedure - see also other step tests. At the end of three minutes, remain standing while you immediately check your heart rate. Take your pulse for one minute (e.g. count the total beats from 3 to 4 minutes after starting the test). Go here for more information about measuring your heart rate. The lower your heart rate is after the test, the fitter you are. Compare your heart rate results to the table below. Remember, these scores are based on doing the tests as described, and may not be accurate if the test is modified at all. 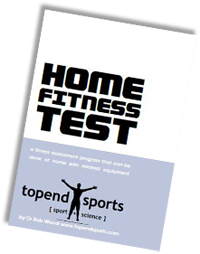 This home step test is based loosely on the Canadian Home Fitness Test and the results below are also based from data collected from performing this test. Don't worry too much about how you rate - just try and improve your own score. Videos of Step tests being performed.